How do you not take everyone’s problems on board? I am very human and yes I am touched deeply at times. However, I believe that if a client is in a deep emotional river, far better for me to keep a foot on dry land and throw a lifeline or encourage them to swim to the side, than both of us to be up to our necks in deep water. I tend to work in blocks of 6 sessions occasionally this is enough. However if issues are linked to child hood for example we could be looking at a much longer term. All clients are very individual. How often do I come for sessions? Weekly is ideal, however I am always open to discussion and can be flexible. A session is 50 minutes and costs £45. For long term work or cases of extreme hardship a concession may be possible. By telephone, email or text. I take daytime and evening appointments and some Saturdays. Any of your queries I am more than happy to discuss with you..
What if I feel unsure about you or I think I may know you? We would discuss this and I would support you in finding a more suitable counsellor. 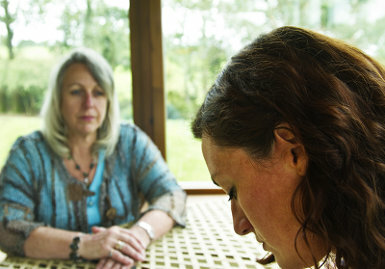 One of the most important elements within counselling is ‘the relationship one we are both comfortable with. "When I met you first I was completely broken, I feel now, not only back together but more than I was before"
"Come to the edge he said. They said: we are afraid. Come to the edge he said, they came. He pushed them…and they flew."